Aquacera counter top filters rest on your counter top and use your existing faucet to supply great filtered water. The Aquacera Fluoride and Heavy Metals Filter reduce heavy metals, color, fluoride, pesticides, bromine, chlorine and chloramines in drinking water. 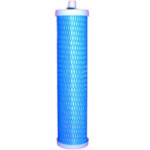 When clean water is not readily available having a large capacity filter like the AquaCera W9371810 SS-4 Gravity Fed Filtration System that includes 2 CeraPlus W9511201 7" ceramic water filter candles can make all the difference. For higher volume filtration needs and greater containment reduction the AquaCera W9371830 SS-4 Gravity Fed Filtration System removes more than 99% of metals, bacteria, and numerous pharmaceutical compounds and includes 2 CeraMetix W9512624 filters. 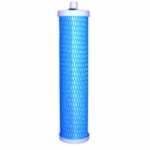 The AquaCera CF-AMB9S AquaMetix compatible water filter uses a proprietary mix of carbon and Zeolite minerals that deliver a filter with superior containment reduction that is Certified for NSF 42 and 53. The AquaCera HCP free standing counter top water filter system comes with you choice of filters to combat pesky water problem and installs onto the existing faucet connection making installation a breeze. When 1 simply isn't enough, the AquaCera Twin HCP counter top dual water system comes with your choice of AquaCera ceramic filter cartridges for the removal of a greater range of waterborne contaminants. 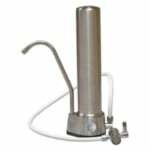 The AquaCera HCS free standing water filter system is made from durable stainless steel, looks good on your counter top, and comes with your choice of filter. 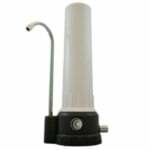 With the AquaCera W9371835 SS-4 Gravity Fed Filtration System that includes 4 CeraMetix W9512624 7" ceramic water filter candles you can provide healthier water in large quantities for your home, while camping, or during extreme situations. 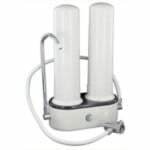 The AquaCera SP-WS-A8B Replacement Spigot fits SS-4 stainless steel gravity filter housings. 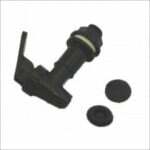 The kit includes a black colored tap and 2 grommets to block unused filter openings. 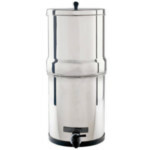 The AquaCera W9371815 SS-4 Gravity Fed Filtration System includes 4 CeraPlus W9371815 7" ceramic water filters and can process larger volumes of water for outdoor event, emergencies, or from use around your home.